We all know the interesting and eclectic history of Nintendo's failed N64 peripheral, the 64DD. 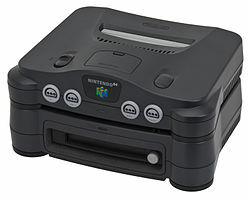 Nintendo announced the 64DD as a way of combating the high price of cartridge games as well as rivaling Sony's Playstation for raw memory space. The add-on lingered in development hell for several years after being revealed but instead of shelving the hardware, Nintendo released it. The Nintendo 64DD was a huge commercial failure. Only 15,000 pieces sold and the remaining 85,000 pieces that Nintendo had originally hoped would sell were scrapped. That is how bad of a failure this add-on was. The 64DD went on sale December 1st, 1999 after originally debuting 4 years earlier at the Nintendo World event. The piece originally retailed at ¥30,000. It was available sparingly in stores in 2000. Knowing that it was doomed to fail, Nintendo made it largely available through a mail-in subscription. This service was called Randnet, formed and named after the two companies that started it, Nintendo and Recruit, a Japanese advertising corporation. Here's the commercial video for the add-on. As a collector, most people gravitate towards this interesting little oddity due to the novelty of it and the fact that it is a true piece of Nintendo memorabilia but then they look at the price and turn away. The market on this piece is all over the place. I have seen them sell for $200 and I have seen them sell for $1,500. There is no stability in this market. Another big problem when trying to purchase on are the extras. The 64DD launched with a keyboard, a mouse, a special "Capture Cart", a modem cart, and 9 different games. Most auctions you find come with some of these extras, which in turn increases the cost. Since this is just Part 1, I will help you buy just the peripheral itself. Like I mentioned earlier, there is the Retail version and the Randnet version. The only differences is the packaging and the Randnet version comes with the modem cart, modem disc, and phone cable. They both come with the red-topped expansion pack that would later be shipped with every copy of Donkey Kong 64. This is the Retail version and sells normally for around $500-$700. It is worth more than the Randnet version despite containing less, this is due to an extremely limited release later in the 8-month lifespan of the add-on. You can often find these on eBay for around $400 complete in box. This was the version sold through subscription and Nintendo tried to buy them back in 2000. Some didn't get returned and are now in the hands of collectors. If you want to purchase just the 64DD by itself, good luck. It is hard to get them unless they are bundled with something but be willing to pay more than $300. I have some good news, they are compatible with NTSC-region N64's so you don't have to purchase a JAP-region one to use it. Now go buy one and stay tuned for Part 2: The 9 Games of the 64DD! Nintendo Power was first published in 1988 and featured Super Mario Bros. 2 on the front cover. Before the magazine was closed in February 2013, 285 issues were published with tons of tips, reviews, strategy, and insider news for Nintendo games. Collecting Nintendo Power magazines has become a popular niche among game collectors and some of them have become valuable too. Volume 1 sells for $150-200 when it is in very good condition. 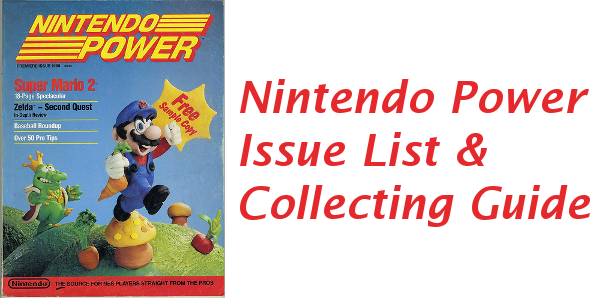 Below is a list of all the Nintendo Power issues with a handy checkbox to keep track of which you have. It also includes what game is featured on the cover and when it was published. Click on any featured game to see the cover art and current value. Nintendo Power was the longest running video game magazine. It was published continuously for 24 years from 1988 to 2012. Nintendo of America published the magazine internally from Volume 1 to Volume 221. In 2007, Nintendo allowed Future US the publish the magazine starting with issue 222 in Decemeber 2007. In August 2012 Nintendo announced they would not renew their Nintendo Power license with Future US and the publication would cease on December 2012. The last issue recreated the artwork on Volume 1 with the current look of Mario and Bowser. It even used claymation like the first issue. Most of the issues in the 285 printed had the same features and articles and news with one main game featured on the front cover. Several issues were special and focused on a particular game or event. These include the strategy guides for Super Mario 3, Ninja Gaiden II, Final Fantasy, 4-Player Games, The 100th Issue, 20th Anniversary Issue (Vol. 231), 250th Issue, and the NES 25th Anniversary issue.